The Regular Season in LPB just ended. Here is the last round review presented by ESL. The most crucial game of the last round was a loss of Halcones (11-4) in Colon on Tuesday night. Visitors were edged by Correcaminos (11-4) 84-81. It ended at the same time the three-game winning streak of Halcones. It was a key game for the top position in the league. The best player for the winners was the former international point guard Trevor Gaskins (188-89, college: Louisiana Tech, agency: Pro Sports) who scored 23 points, 5 rebounds and 4 assists. Amir Alvarado (198-84, college: Marshalltown CC) chipped in 21 points and 6 rebounds. Correcaminos' coach Casimiro Laguna used entire bench in such tough game. At the other side the best for losing team was guard Geno Luzcando (190-95, college: Idaho St.) who recorded 22 points, 7 rebounds and 4 assists. Defending champion used an opportunity after Universitarios lost their game and moved up joining them at the top position which they share with defeated Halcones. An exciting game was played in Aguadulce. Third ranked Caballos faced 4th placed Panteras. Host Caballos (9-6) defeated guests from Panama City (7-8) 82-73. It was a good game for naturalized American point guard CJ Rodriguez (188-94, college: S.Nazarene) who led his team to a victory with a triple-double by scoring 17 points, 11 rebounds and 13 assists. Angel Matias contributed with 30 points and 5 rebounds for the winners. 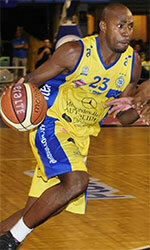 Dominican power forward Brayan Martinez (203-91) answered with 9 points, 15 rebounds and 4 assists for Panteras. Caballos have a solid series of three victories in a row. They maintain third place with 9-6 record having just two points less than leader Universitarios. Panteras at the other side keep the fourth position with eight games lost. Bottom-ranked Toros managed to get a second victory, breaking the series of four consecutive losses on Thursday night. 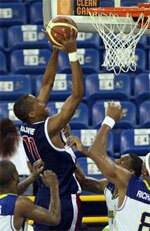 This time they won against fifth-ranked Aguilas in David 81-68. It was a great evening for Gil Atencio who led his team to a victory with a double-double by scoring 27 points, 20 rebounds and 5 blocks. Toros' coach Humberto Rapon used a ten-player rotation which allowed the starters a little rest for the next games. The best for the losing side was Lovell Cook with 24 points and 4 assists. Toros maintains sixth place with 2-13 record. Aguilas lost fourth consecutive game. They keep the fifth position with ten games lost. An exciting game was played in Aguadulce. Third ranked Caballos faced 4th placed Panteras. Host Caballos (9-6) defeated guests from Panama City (7-8) 82-73. It was a good game for naturalized American point guard CJ Rodriguez (188-94, college: S.Nazarene) who led his team to a victory with a triple-double by scoring 17 points, 11 rebounds and 13 assists. American-Puerto Rican forward Angel Matias (193-92, college: Georgia South) contributed with 30 points and 5 rebounds for the winners. Four Caballos players scored in double figures. Dominican power forward Brayan Martinez (203-91) answered with 9 points, 15 rebounds and 4 assists and Josimar Blenman (200-89, college: Globe Tech JC) added 14 points and 11 rebounds in the effort for Panteras. Caballos have a solid series of three victories in a row. They maintain third place with 9-6 record having just two points less than leader Universitarios. Panteras at the other side keep the fourth position with eight games lost. The most crucial game of the last round was a loss of Halcones (11-4) in Colon on Tuesday night. Visitors were edged by Correcaminos (11-4) 84-81. It ended at the same time the three-game winning streak of Halcones. It was a key game for the top position in the league. The best player for the winners was the former international point guard Trevor Gaskins (188-89, college: Louisiana Tech, agency: Pro Sports) who scored 23 points, 5 rebounds and 4 assists. Amir Alvarado (198-84, college: Marshalltown CC) chipped in 21 points and 6 rebounds. Correcaminos' coach Casimiro Laguna used entire bench in such tough game. At the other side the best for losing team was guard Geno Luzcando (190-95, college: Idaho St.) who recorded 22 points, 7 rebounds and 4 assists and naturalized American point guard Bradley Tumer (183-89, college: Clayton St.) added 16 points, 9 assists and 5 steals respectively. Five Correcaminos and four Halcones players scored in double figures. Defending champion used an opportunity after Universitarios lost their game and moved up joining them at the top position which they share with defeated Halcones. Bottom-ranked Toros managed to get a second victory, breaking the series of four consecutive losses on Thursday night. This time they won against fifth-ranked Aguilas in David 81-68. Toros dominated down low during the game scoring 62 of its points in the paint compared to Aguilas' 30. They outrebounded Aguilas 48-33 including a 37-25 advantage in defensive rebounds. Toros looked well-organized offensively handing out 31 assists comparing to just 16 passes made by Aguilas' players. It was a great evening for Gil Atencio (202-96, college: St.Clair) who led his team to a victory with a double-double by scoring 27 points, 20 rebounds and 5 blocks. Point guard Joel Munoz (183-80) helped adding 15 points, 8 rebounds and 17 assists. Toros' coach Humberto Rapon used a ten-player rotation which allowed the starters a little rest for the next games. The best for the losing side was American swingman Lovell Cook (201-90, college: New Orleans) with 24 points and 4 assists and the other American import center Travis Elliott (203-91, college: Beth.-Cookman) produced a double-double by scoring 12 points and 11 rebounds. Four Aguilas players scored in double figures. Toros maintains sixth place with 2-13 record. Aguilas lost fourth consecutive game. They keep the fifth position with ten games lost.